Are you longing for the best drill press? Well you need not look that far as we have reviewed the finest drill presses and lined them up side by side here. The drill press generally works the same way, but their features, accessories, size and power varies, and the type you buy can spell the difference in terms of performance. Since going through all drill press reviews online is impossible, just read this review instead. 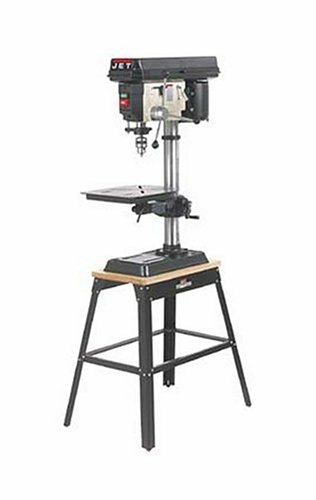 If you want the best drill press for the money, check out the WEN 4208, as it is a powerful 5-speed, 8-swing drill press that carries enough power to drill through plastic, wood, metal and other materials. The maximum drilling capacity is half an inch in an inch thick cast iron, and the WEN is accurate too. If you need a drill press that is powerful and accurate, the WEN will do the job right, and it’s more convenient and precise than your typical handheld drill. Construction wise, the 4208 is pretty impressive as its frame is cast iron, and the induction motor comes with ball bearings that extend its lifespan and ensures balanced performance even when running at high speed. The 4208 drill press has half inch chuck with JT33 spindle taper that allows you to work with several types of bits. Furthermore, the worktable can bevel left to right at 45 degrees right or left, very useful when you’re working at angles. The Skil is frequently mentioned in drill press reviews, and the praises are justified as the tool is well suited for a DIY woodworker who wants something more precise than a typical handheld drill. The X2 2-Beam Laser is great for creating accurate hole alignments, and the depth adjustment mechanism allows for consistent drilling down. There are five speed settings to choose from, and they’re all capable of going through metal, wood and other materials. The drill press is compatible with large diameter bits for both cutting and woodworking, and the work surface can tilt from 0 to 45 degrees. Of all the features here, the X2 2-Beam Laser is probably the most important because it leads to pinpoint alignment of holes, but the overall quality is just as good. In terms of performance the Skil is one of the smoothest and quietest in its class and has the feel of a precision instrument. The laser guidance system works and is very useful for those times when you’re drilling tiny holes. As far as design is concerned, the Skil is exceptional. Some assembly is required but the instructions are easy to follow. Changing the speed settings is straightforward too: loosen up the motor, position the belt on the chosen pulleys, pull the motor and fasten it. That’s all there is to it so if you’ve used a drill press before, there’s nothing to it. The Delta 18-900 is a top rated drill press built for professionals. The most significant feature here is the 16 speed setting, as this allows you to achieve maximum drilling performance regardless of the materials you’re using. There’s also a rack and pinion height adjustment on the table which you can lower or raise until the desired height is reached. The locking levers are adjustable so you can work on different angles, and the TwinLaser provides precision drilling. The Delta also comes with its unique Auto-Tensioning Belt Drive System that ensures easy and quick speed changes. Unlike other drill presses, the Delta does not compromise transmission and keeps the motor and belt tension in place. The 6 inch quill stroke enables you to drill deeply and use the tool for industrial applications. In terms of power the Delta is equipped with a ¾ HP motor that gives it the power to handle various projects. The large table has a proprietary design, tilts 0 to 48 degrees and bevels 0 to 90 degrees, and the T-slots are suitable for clamping. If you’ve been checking out candidates for the best drill press of the year, you would be familiar with the PM2800B from Powermatic. It is quite simply a very powerful drill press with features other drill presses can only dream of. The worktable is expandable, and when at full length is the biggest one available. You can rotate the table 90 degrees for precise application, and it is powered by an infinitely variable 1 HP, 18 inch motor. What this means is you can change the speed without changing the belt or stopping the motor. Setup and use are easy and should pose no problems, and the double LED lights set close to the spindle provide sufficient illumination. What’s really nice about the light is they’re bright enough you don’t feel the need to use another light source. Adjusting the plunge depth is easy: press a button and you’re done. With the kind of power the PM2800B has, it should come as no surprise the drill press handles metals and other materials easily. Aside from the 6 inch quill travel, the drill press comes with an adjustable fence system so its relationship with the table is exactly 90 degrees. Aside from perfectly aligning stock, you can set the material stop so repeated actions proceed faster. While you’re working, the digital RPM readout lets you optimize the speed of the spindle so it fits the task at hand. The Powermatic also comes with a laser which serves as a guide for your work, and when the time comes to change the bit, the keyless chuck makes it easier than before. Any way you look at it, the Powermatic PM2800B 1792800B is a powerful drill press that gets the job done. The 354165 from Jet is good enough for use in workshops, as its power and performance are hard to match. It comes with 16 speed settings, and that alone makes it one of the best drill presses today. Drilling is its primary function but is powerful enough to be used in sanding, shaping, mortising, routing, plating and more. All the components are all industrial grade, and the worktable can be rotated 45 degrees and the clamp has a quick release feature. With the Jet drill press it’s easy to make adjustments to the speed, and the ¾ HP is potent. Also worth mentioning is the column and base design: they are both made of metal, so no matter what you’re working on, the Jet won’t give way regardless of the material you’re working with. The locks and clamps are well made, and they help prevent the drill press from vibrating while in use. Vibration is one of the most common causes of drill press fatigue, so its inclusion here is crucial. The Jet JDP-15M is built for professionals, but it’s just as capable when it comes to small and large tasks. Each task has its own requirements but since the worktable is easy to adjust (via the crank), you’ll have no trouble finding the right setting. Besides the aforementioned 45 degree rotation, the Jet has a generous work surface (10 by 13 inches), and the table comes with mounting grooves. The Jet also has a 15 inch swing and combined with the 115/230 volt, ¾ HP motor and variable speed you get a lot of extra power. And if you drill at the same depth often, tension spindle return (adjustable) will come in handy. When shopping for a drill press, you need to get familiar with the various types. Bench Top Models: if you opt for a bench top unit drill press, expect the swing to be around 8 to 15 inches, and the stroke is around 2 to 3 3/8 inches. A bench top drill press is ideal for many because they’re compact and don’t cost as much as other drill presses. For household DIY projects, a bench top drill press will do. Floor Standing Drill Press: with this you’ll get a 13 to 20 inch swing and a 3 to 6 inch stroke. Floor standing drill presses have more capacity and greater power, so it may be too much for home use and more suited for professional applications. Magnetic Machines: the swing is around 4 to 8 inches, and with a magnetic drill press, you’ll be able to go through metal objects as thick as four inches. This is a heavy duty drill press and meant for professional use. Radial: this drill press comes with a 24 inch swing while the apparatus has special features meant for angled drilling. If you bore through materials that are at least 17 in. wide, a radial drill press is an option. As for features, a Poly-V belt could come in handy as it provides power for the motor and helps improve performance. You should also look for a drill press that has a TEFC (totally enclosed fan-cooled) to protect the motor from debris and dust. TEFCT or something similar would also go far in terms of prolonging the machine’s lifespan. Some of these drill presses come with a mortising package that makes it easier for you to make rectangular holes and enhance the drill press’ versatility. On their own these tools are powerful, but the addition of kits expands their power. Another feature that you’ll often come across is the rack and pinion height adjustment. If you have an adjustable table, you’ll have more flexibility when it comes to work and be more precise. If you choose a drill press that’s capable of cutting at angles, table shifting will be necessary to make certain you get the cut right. You may also want to look for a drill press that has a table with space by the edges, helpful for fence and vise attachments. The more you use a drill press the more you’ll need flexibility, and in many cases a built-in light would be quite handy. Getting the best drill press doesn’t need to be confusing as it just involves doing research and comparing the specs and features with your needs. What this product review has done is simplify the matter even further by providing you with a list of the top five drill press, so now you can pick and choose.